When I need a hostess gift, thank-you present, or an arrangement for a special friend, I make a bouquet of succulents. I start by selecting a coffee mug or glass container (usually a jar, thrift-store vase, or clear bottle), the size of which determines the size of the arrangement. Then I head into the garden with clippers. I cut a dozen or so succulent rosettes, and in 2 or 3 minutes per cutting, they’re wired onto stems and ready to be arranged. Of course if the cuttings have long stems, you needn’t wire them onto faux ones. But most succulent rosettes have short stems or none at all. See more design ideas and colorful combos on this site. 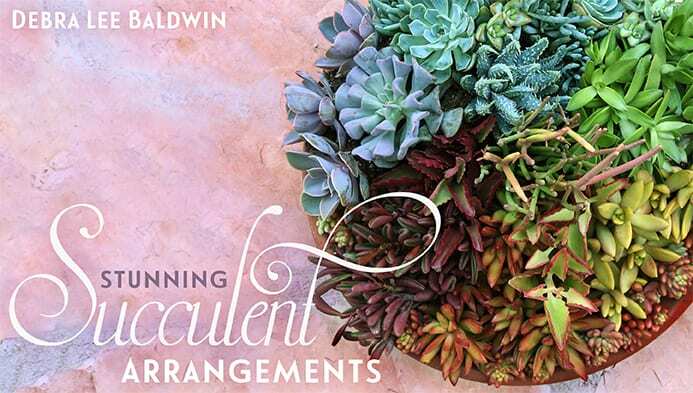 Echeverias, graptosedums, crassulas and kalanchoes lend themselves beautifully to bouquets because of their colorful leaves and rosette shapes. They’re easy to attach to faux stems, need no water (because they live off moisture in their leaves), look good for a long time, and can later be planted as cuttings. — Garden clippers, wire cutters, and scissors. — A vase, mug, jar or some other holder. Height and size don’t matter, but keep in mind that your bouquet should be at least half as tall as its container, and the taller the arrangement, the more succulents you’ll need. 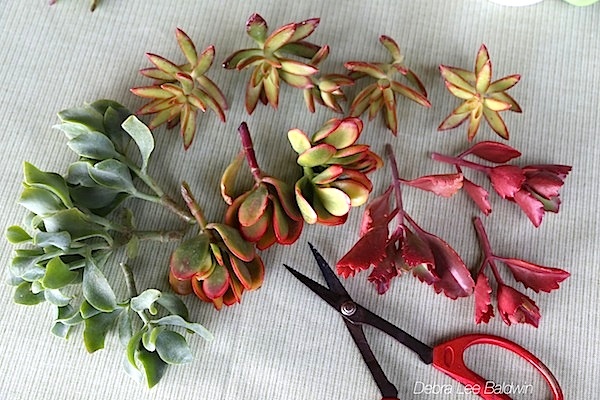 — Assorted colorful succulent cuttings. In order for stems not to split when you wire them, they should be about the diameter of a chopstick but no thicker than your little finger (because thick tissue is tough to push a wire through). — 22-gauge florist’s wire. I buy it in prepackaged, 18-inch lengths from a craft store. You’ll need one length of wire for each rosette. — Bamboo skewers (sold at any supermarket) or floral picks. These are useful for strengthening and stabilizing the faux stem and holding the cutting upright. They’re inflexible, so plan to cut some of the faux stems shorter to make a balanced arrangement. I usually wire a few lightweight cuttings without sticks to have some to bend outward. — Ballast to anchor stems. Their high moisture content makes succulent cuttings top-heavy when wired, so stems need to be held in place with sand, pea gravel, a floral frog or foam, crushed glass or—in a pinch—dried peas or beans (careful not to get them wet). Cut wire in half and thread each 9-inch-long piece into the stem just below the lowest leaf. Wires should be at right angles to each other, so when you look down on the succulent, it’ll look like a plus sign with a plant in the middle. Place a floral pick or bamboo skewer alongside the stem or, if it’s wide enough, up through the middle. Fold wires downward so they encase the stem stub and skewer. All four wires should touch each other. Use wire cutters to cut the stem to whatever length you want it to be. Add ballast to the container and insert the wired rosettes into it (with dried floral material if you like) until you have a pleasing bouquet. This bouquet is from my online Craftsy Class. 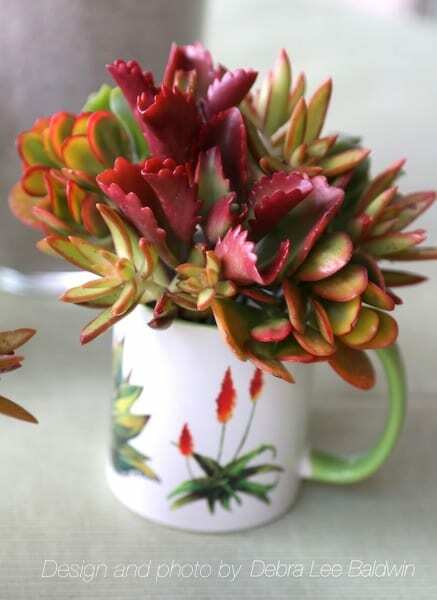 How to Make a Succulent Bouquet is one of seven sessions of my online Craftsy class, Stunning Succulent Arrangements. Use this link to take the class (all seven lessons) at 50% of the regular enrollment price—$20 instead of $40! You’re very welcome, Rose! Have fun! You have such a talent in design and your bouquets and designs are terrific! When I studied floral design at Cal Poly in the late 60’s, a cardinal rule of instructor/designer Bob Gordon’s was to “never let your mechanics show!” Nowadays attitudes are so much more casual it probably doesn’t matter; I prefer hidden mechanics still, but it’s just a personal preference. Thanks, Sue. I’m aware of the rule but thought that showing that the rosettes had faux stems made the bouquet more interesting. But now I think that anything that fills the container that isn’t water would have the same effect, and doubtless would look better!